Fourth Row Center: Film Writings by Jason Bailey: On DVD: "Youssou N'Dour: I Bring What I Love"
Senegalese singer Youssou N'Dour is blessed with a beautiful, rolling voice and a palpable passion for performance--when you watch him on stage, you can't help but be moved by his considerable power and emotion. He is a superstar in Africa, primarily for his pop songs that mix traditional griot music with sounds from around the world; he's known to Western audiences through his collaborations with artists like Peter Gabriel, Wyclef Jean, and Paul Simon. Youssou N'Dour: I Bring What I Love begins as a biography and concert portrait of the artists, but becomes an intriguing look at an artist a crossroads. According to N'Dour, when it comes to music, he has it in his blood--his ancestors were griot singers, "the keepers of stories." He always wanted to be a musician, and director Elizabeth Chai Vasarhelyi delves into his early experiments and influences with a wealth of archival material, tracking with the artist as he finds his unique voice and style. He eventually found success, and connections with his fellow artists; he appeared alongside artists such as Gabriel, Springsteen, Sting, and Tracy Chapman on Amnesty International's Human Rights Now tour (there's a wonderful clip of him performing "In Your Eyes" with Gabriel), and recorded the duet "7 Seconds" with Neneh Cherry, which became Africa's first platinum record. But the primary focus of the documentary is his 2004 Egypt album, which he originally envisioned as a melding of his music and his faith (he is a practitioner of Sufism, a mystical interpretation of Islam). The album was to have been released much earlier, but he postponed it in the wake of the 9/11 attacks. He ultimately decided its message needed to be heard, and planned not only a wide release, but a worldwide tour. The film's drama comes from the reaction that follows. While on tour, N'Dour experiences the difficulties of fusing the liturgical with the commercial, the music with the message--some object to the group playing during Ramadan, while the strict faith of some of the musicians prohibits them from performing in a room where alcohol is being consumed (a club manager is seen on stage, awkwardly explaining why the bar is closed). N'Dour finds that he's damned if he does and damned if he doesn't; he gets the blessing of important religious leaders, but when he takes the pilgrimage to the sacred city of Touba, rumors spread that he has been "profaning sacred sites" with his heathen show. Back home, record sales are a bust--in no uncertain terms, the artist and his representatives are told that he cannot sing pop songs about their religion. Oddly, the album had a much more positive reception in America, where it won the Grammy for Best Contemporary World Music Album. His popularity in the States has only risen; the film ends with N'dour in New York City, preparing for a Carnegie Hall performance. There is a moving moment backstage, as he stops to remember his recently-deceased grandmother, who put the love of music into him; the film dissolves back to one of his final meetings with the elderly woman. It's a touching bit of personal filmmaking, but it also reveals what the film has been missing--the kind of emotion that the artist pours out on stage. Vasarhelyi utilizes a direct-cinema style, observational rather than involved, but that hands-off technique is a bit limiting; we understand why he does what he does, but not a sense of his real passion, of what makes him tick as a human being (we're shocked, over an hour in, to discover how many children he has--he appears to have no personal life at all). It's a decently-made documentary, but keeps its distance more than we might like. 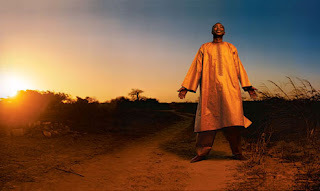 There's joy in the music, and the performance of it, in Youssou N'Dour: I Bring What I Love, and that music is the film's best feature--even when we don't quite understand the lyrics, the feeling is infectious. In documentary terms, it's not quite as successful; we feel as though we've grown to understand the artist, but to know very little of the man. "Youssou N'Dour: I Bring What I Love" is available now on DVD. For full A/V and bonus feature details, read this review on DVD Talk.